I have recently returned from a week at The Biggest Week in American Birding, a ten-day birding festival in Northwest Ohio. Nothing in my experience as a New Mexico birder prepared me for the dazzling array of migratory warblers that I encountered on the boardwalk at Magee Marsh, located on the south shore of Lake Erie. If you're a birder, you MUST go to The Biggest Week. Kenn and Kim Kaufman and their dedicated team put on a wonderful event. I arrived in Ohio practically foaming at the mouth in anticipation of seeing Eastern Wood Warblers. Although we have many lovely birds New Mexico, there is a notable shortage of warblers. Nothing in my prior birding experience prepared me for the crowds of birders on the boardwalk at Magee Marsh. I thought I would hate the crowds. In fact, the birders were friendly and helpful, and they were quick to point out tiny warblers to a New Mexican who was accustomed to looking for much larger birds. The boardwalk at Magee Marsh is as much a social experience as it is a birding experience. Kim and Kenn Kaufman, Jeff and Liz Gordon, Greg Miller and many other well-known birders are on the boardwalk, and they are happy to talk to birders from all over the US. On my first morning in Ohio I took a photography class from Christopher Taylor. I have followed him on Twitter for over four years, and I was delighted to meet him in person. Christopher Taylor (far right) and members of the photography group. A Yellow Warbler hunts for insects in the leaves. A Palm Warbler flies by. A Hooded Warbler hides in the leaves. A Prothonotary Warbler announces his presence. A Black-throated Green Warbler sings from a branch above me. The Northern Parula is one of the prettiest of the Warblers. The Yellow-rumped Warbler at least was not a new bird for me. I love the colors of the Chestnut-sided Warbler. The Blackburnian Warbler is truly a stunning bird. It was amazing to see many Magnolia Warblers flitting through the trees at eye level. Of course we saw other birds besides warblers, although warblers were the main attraction. These Great-horned Owlets were almost ready to fledge. … although his attention was probably focused on this lovely lady in the trees. We were excited to see a lovely Scarlet Tanager. Sharon Stiteler, the BirdChick, digiscoped an Eastern Screech Owl for me with my iPhone. One morning we had a great deal of excitement when a Kirtland's Warbler was spotted near Magee Marsh. Approximately 300 birders rushed to get a look at the bird. Although I did get good looks at the bird through a spotting scope, I did not get a photo of it. I did, however, get a photo of the crowd that came to look at one tiny bird. Birders. Lots and lots of birders. Of course we did not spend all of our time birding. It was also a time to reconnect with birding friends and meet new ones. Birding girlfriends Dawn Fine, Kelly Riccetti, Linda Rockwell, Sharon Stiteler and Debbie Miller on the boardwalk. Photo courtesy of Paul and Debbie Miller. Sharon Stiteler, the BirdChick, hosted a Birds & Beers event that was THE social event of the festival. Kim Kaufman and Sharon Stiteler share a moment at Birds & Beers. It was a fun evening! I enjoyed meeting birding guide Gunnar Engblom, with whom I shared the house on Lake Erie that I rented for the week. Gunnar's song "Bird Party" became the unofficial anthem of The Biggest Week. 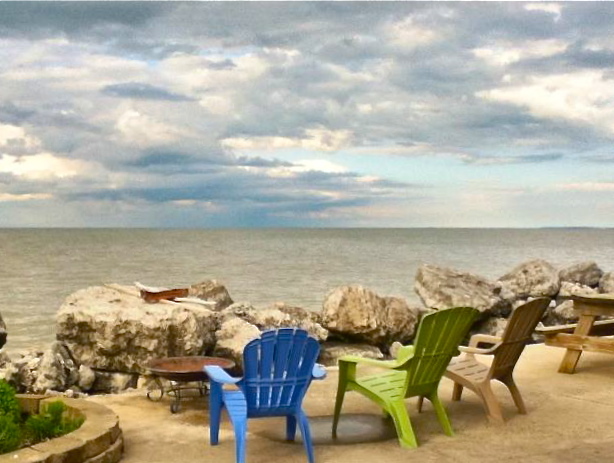 I cannot forget to mention the views from the patio of my rented house on Lake Erie. This is the patio overlooking Lake Erie. Patio of the Lake Erie house. Photo courtesy of Dawn Fine. … it was a wonderful place to stay. The Biggest Week in American Birding is a spectacular festival. There are many fun things to do, many beautiful birds to see and many wonderful birders to meet. If you haven't been to Northwest Ohio for this festival, you should make plans to attend. Linda, what a fantastic array of birds! Wow, you must have had an awesome week. Mia, it was an absolutely wonderful week with wonderful birds, wonderful birding friends and lots of fun. You really should make the trip next year! Wonderful post; wonderful photos. So glad you went and had such a great time. Great post, Linda. Great pictures. Sounds like you had a blast. I can see why you want to go back next year. Bob, seeing all those warblers was absolutely amazing, and seeing so many birding friends was even better. Kim and Kenn Kaufman and their helpers put on an outstanding event. Spending time with you and our birder friends sharing these beautiful moments in nature was an incredible experience. Linda, your captivating images and writings are a wonderful remembrance of one of the most memorable birding experiences I have ever had. Great post Linda, so beautifully written and presented. The biggest week was really incredible to experience. It was wonderful finally meeting you after blogging/tweeting for years. Many wonderful birds, memories, friendships this past week. Love all the pics! ... Awesome rainbow from your cottage view! Debbie, I so enjoyed meeting you and Paul and getting to spend time with you! Getting to meet birders with whom I've connected online and re-connecting with birders whom I had met before was the best part of the festival. The boardwalk and the warblers were amazing though. I can hardly wait to go back next year!! I hope you don't mind that I used Paul's photo. He really took a nice one, and I didn't have anything nearly as good. Yay Paul, and thanks! The whole week was absolutely amazing. The Biggest Week is an event that every birder should attend! What a beautiful place! Love those lake pictures. It looks like the birds were just the icing on the cake. Great story. Everything about the week was just wonderful--the birds, the birders, the house on the lake, the socializing. It just doesn't get any better! Wow! looks like an outstandingly good time! great photos of such a nice variety of warblers. Maybe some day I'll get there. It was a wonderful time. The birders and the warblers were outstanding! You should certainly make an effort to go. It's an excellent event. Wow, looks like you and all the others had a great time at Magee Marsh. I loved all the warblers and the owls. It is nice to put a face with all the bloggers too. Great post. I hope to see you in Brazil! Hi Paulo. I'm Linda, not Bob. Bob is the curator of this blog, and I am a guest poster. I did enjoy meeting you at The Biggest Week. While you might have been the only Brasilian at The Biggest Week, you represented your country very well. I still have your card! 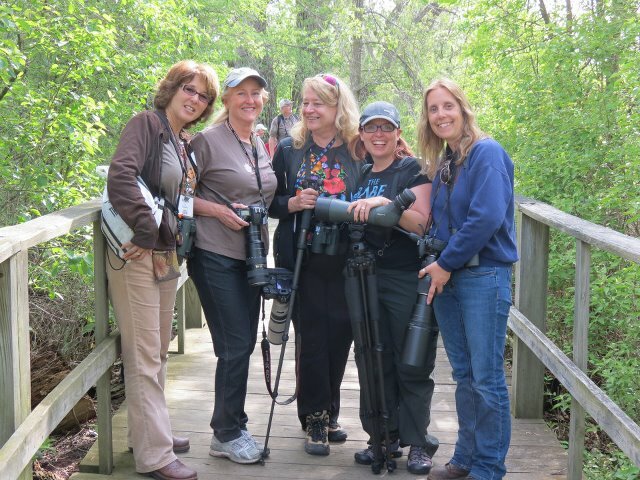 Linda, sounds like you had a fantastic time at the Biggest Week in American Birding event. Gorgeous birds galore and friendly birders. Sounds perfect to me! I so enjoyed scrolling through your wonderful images viewing all the beautiful birds your were fortunate to see. Lovely scenic shots, as well! Awesome post! Wow! This is amazing....can see why you were so excited and still talking about it! So glad for you that you were able to be there! It was a wonderful festival! We just don't have all those beautiful eastern wood warblers in the west. it was a real treat to see them!